Can I keep track of my shipping cost as I shop? Can my orders be tracked once they are shipped? With which shipping carrier is my order shipped? How long does it take for a shipped order to be delivered? Who pays for custom fees once they arrive in my country? How long does it take for Storkz.com to ship an order? What are my payment options when purchasing? Can I pay in my local currency? Will I be charged an exchange fee? I ordered an item and decided to cancel it, what can I do? How can I return a product that I ordered? If a product is faulty or stops working can I get a replacement? Are the electrical items sold on your site 220V? At Storkz.com we strive to sell the best brand name products sold in the United States to you our international customer, at prices that are even competitive in the US. Selling US products at competitively low prices is not enough, though, as shipping prices can often be so high that purchasing a product to be shipped internationally just isn’t worth it. That’s why our shipping cost is among the lowest available for international purchase from the US. Isn’t it annoying when you shop on a site only to find out during checkout that the shipping cost is so high the order isn’t worth it? That’s why we show you your shipping cost while you shop. Just choose your destination country on the upper left screen of your browser and you’ll see your shipping cost on the upper right of your browser as you shop (see “Can I keep track of my shipping cost as I shop?” below). Our low priced products & shipping cost plus our dedicated staff customer service representatives who's first priority is you, our Storkz.com customer, is why you should shop Storkz.com. The shipping rate that appears is the lowest shipping cost option available to you. 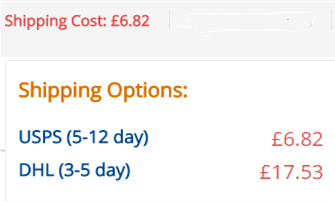 Hover over “shipping cost” and you’ll see all options and shipping costs available (see image below). Once your order is shipped we’re just as concerned as you are that your order arrives safely. That’s why our shipping methods include a tracking number. Tracking numbers may take up to 24 hours to appear on our site from the time an item is shipped. The exception is the "USPS Economy Non-Tracked" shipping option which does not ship with a tracking number, but is insured. We only offer the "USPS Economy Non-Tracked" option for low priced orders. With which shipping carrier is my order delivered? We ship both via USPS standard, USPS economy and Express. The USPS shipping options are shipped by USPS (United States Parcel Service) to the local country's post service, and the local country's postal service delivers the parcel. The "Express" shipping option utilizes a network of shipping carriers to deliver your order in the fastest method available. The "Express" shipping carrier depends on the country where the order is being delivered. How long your order will take until it is delivered depends on the service that you choose. The date range for each shipping method appears next to each shipping option that you will be available to you at checkout. You can also see the shipping cost of your cart items and the date range of delivery by hovering over the words "Shipping Cost" on the upper right of your browser (see the question "Can I keep track of my shipping costs as I shop" above). Who pays for custom/import related fees once they arrive in my country? If the "Express" shipping option is available and you choose that option, then Storkz.com is responsible for the custom/import related fees. You will not be charged for custom/import related fees. For shipping options other than "Express" you are responsible for any taxes or duties that your country may charge you. For many countries, shipping via USPS is a way to circumvent having to pay taxes or duties. Also many countries do not charge a custom fee for purchases under a given amount. The rules defining custom fees are specific to each country. It can take 1-3 business days to ship an order. We do our best to get your order shipped as quickly as possible. Yes, you can choose to pay in your local currency. To choose your local currency click on the “Change Country” button on the top left of your browser. You’ll see a dropdown for “Preferred Currency”. When you choose your preferred currency the pricing for the entire site changes to reflect that your currency choice. You will not be charged any exchange fee if the card you are using is issued in a country where the currency is the same as your “Preferred Currency” choice. Most electrical items sold from the US are 110V. However many items are dual Voltage and are both 110V and 220V. Computer & Cell phone items are often dual voltage, while household items like mini Vacuum cleaners or electric screwdrivers are often 110V only. When ordering an electric product please clarify that the item is the voltage that you desire. If you can’t tell please contact us, and we’ll help you determine the voltage.